kidnapped Mario! Peach decides to venture out to rescue Mario and stop Koopa! off of SMB1, with my own art style mixed in here in there. The ZIP file contains the BPS, a Readme, and a mockup SNES Box Art I made. This game is soooooooooo good for a demo! But...why...have...her...sleep...in...the...beggining...? One of the best rom hacks i have played! The peach design comes from that one Mario Bros resource pack for Minecraft, right? I remember using it around a year ago, seeing the Peach on the title screen in the Minecraft paintings and wondering why she has bat wings for eyelashes. Anyways, this looks neat. I like the 8-bit aesthetic. 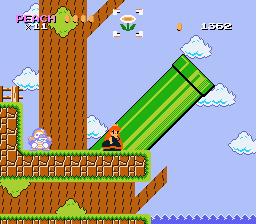 I say keep the Peach player graphics themselves, they're not bad if you ask me. Really? So I'm the only one here who likes this? I'm glad to see that there are hackers that DON'T intend to spam the site with a bunch of Kaizos. Finally! An actual GAME with story and adventure. PS. I like em thicc like that. I hope to see some R34s of this soon. I mean, if Bowsette can spread faster than the California wildfires, this princess should as well, right? The gameplay is excellent with beautiful levels and designs. Can't wait to get the full version of this. Yeah, like others said Peach looks a bit fat here, otherwise nice to have another character to play. Like the SMB 1 graphics and style, but whats about the coins? Took me a while to find out you get coins too from the goal-flag, but is there any use for them (or maybe planned)? Ok it looks like you alot of work into ripping all those graphics and putting them in, and other stuff I see too in the screenshots. But why is peach so large maybe you should have called Mario's long lost sister something . I'm led to believe Bowser is framed and peach ate Mario. Regardless of that small nitpick alot of work went into this and I like these 8 bit style hacks. I'm going to play this . And you damn well know nerds are playing the shiz out of this after dark. Any particular reason why Peach is thicc af? Well, I've accepted this because I feel a lot of my issues with it are more towards the more nitpicky side though I do hope for you to look into them for future releases. The main issue here are sprite related issues - slowdown and vanishing tiles. It's not too intrusive and doesn't show up in every level, but it stands out, especially in Frigid Peak 3, and levels where you use Lakitu. Another thing is that while most of the levels have the player active and paying attention to the level, a select few, mainly Green Hill Zone can be very barren. That level has barely any challenge to it I feel. I also noticed that spinies don't seem to be affected by the cape spin which is odd. Gnarly! I adore the design you gave Peach. Loving the effort you've put into the game's level design. Keep up the good work! This rom feels fun and light. I look forward to the full release. Peach's animations are adorable. my only problem is some of the sprites look derpy, and the re-design for peach looks odd (no offense), also the fami-con style really dampens it personally, mostly because the new sprites and re-used sprites do not mesh well, and make it a bit of an eye-sore. 5/10, good job so far, mostly just have problems with the graphics of the game, but other than that and a few odd collision issues due to the graphics. All around a fantastic little game. Peach's design is great, and there's a lot of personality in her sprites and animations. The level design is solid too, and I'm a fan of the way you made backgrounds using the castle tiles. Great Job! Well, as far as a demo can go, it's pretty decent. I'm not sure how much I agree with Peach's... appearance, but whatever, that's not exactly important. What is, however, is that her sprite has some glitchy collision, probably because it's fairly unorthodox compared to the regular Mario's. It leads to her falling through invisible blocks and hitting them on the way down. As far as difficulty goes, the first two worlds are mostly fine, but I feel like the third and fourth worlds are swapped. The latter feels much easier than the former, even without the ice factor. Overall, fairly decent demo and premise. Looking forward to the finished hack.